This activity is a simple one, but it goes over very well with my students. Yes, even college students like to break out the crayons & markers every once and a while! The idea is that drawing their ideas in Spanish will help enforce their language learning and develop the skill of thinking in Spanish. I use this activity as a review before a quiz that covers vocabulary for descriptions, the present tense verbs, different verbs for expressing “to be,” and comparisons. As you can see in the paragraph depicted to the left, it is pretty manageable to fit in all of these elements. 3. Peer editing: Students swap papers with one or two classmates. 4. Visually reinforcing the grammar: Students highlight or circle the different verbs using different colors to reinforce the grammar aspect of the lesson. 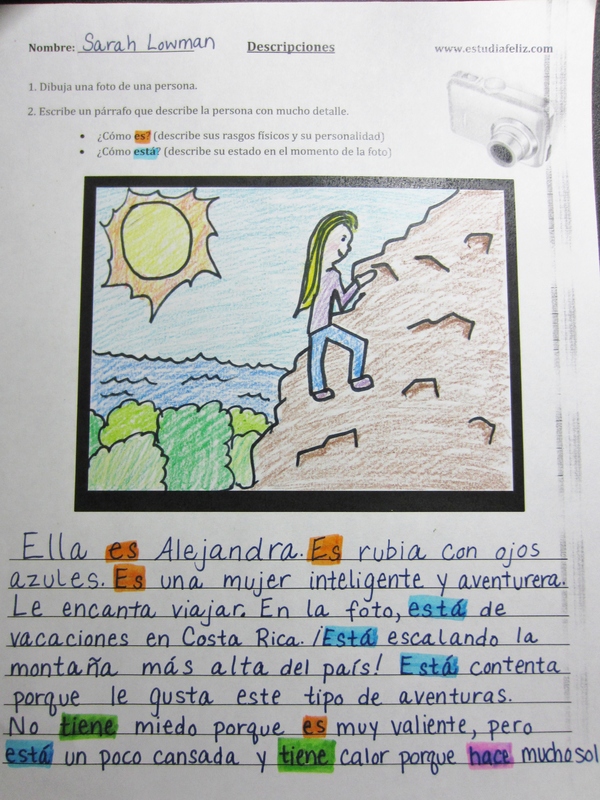 For example, highlight all forms of the verb ser in orange and all forms of the verb estar in blue. Now, the paper may be a more helpful study tool for visual learners. The sample pictured here is the one I use as a model while introducing the activity. Here´s the PDF worksheet you can print! If you use this activity in your classroom, please leave a comment because I´d love to hear how it goes! Also, suggestions are always welcome! Here are some samples of my students´work! Thank you so much for this idea. I modified it some but it was a great starting point. We used it to write about ser and estar. I had students draw a picture of themselves or bring a picture, and most chose to bring one (not as creative as your students:) They wrote at least 10 sentences, 5 with ser and 5 with estar. We were really able to work on creating more complex sentences and adding details. Of course the best ones used a variety of verbs in addition and the very best were telling a story about what was happening in the picture. Thanks for commenting, maestraloca! [I like your username :)] I like your modification to focus on ser and estar! This could be made into an activity to continue throughout the course. Add another page and illustration to their story as they learn new vocabulary and grammatical forms. By the end of the year they’d have made their own storybook and be able to see how much they had learned over the year. Yes, that´s a great idea! Thanks for sharing. thank you so much for this great lesson. I used it with my students today and it was well received! Great to hear, Karen! Thanks for the comment! Thank you, Leslie! I’m glad you can use this activity!